A sporty, easy-to-drive childhood introduction to the world of radio-controlled cars. Johnny Coupe is ideal for both indoor and outdoor play. 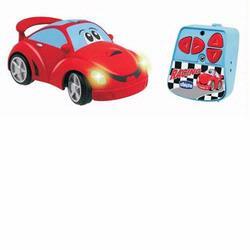 The car moves in four directions (forward, reverse, forward left and forward right) and has real working front and back lights which can be activated by pressing any of the easy to use buttons. The remote can also be attached to the car, and its antenna becomes a handy carry handle.